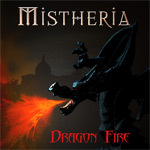 Keyboard guru Mistheria, known for his extensive contributions to the works of others as well as his own, returns with a new solo project Dragon Fire. If keyboard driven melodic heavy metal is not your thing, you don't have to stop reading. Unless, of course, the idea of the 'keytar', of which Mistheria is a proponent, is repulsive, then you might want to turn away. While the expectation of his excellent keyboard virtuosity remains, Mistheria's song composition is much more well-rounded and comprehensive, thanks to the inclusion of some very talent supporting players. Dragon Fire includes the vocal talent of John West (Artension/Royal Hunt), Rob Rock (Impellitteri/Solo), Mark Boals (ex Malmsteen/Ring Of Fire/Royal Hunt), Lance King (Balance Of Power) and Titta Tani (ex Astra / Ashent). Excepting Dragon Fire and Eye of the Storm, each vocalist supplied their own lyrics and melodies. On guitar Mistheria recruited George Bellas (solo/Ring Of Fire), Neil Zaza (solo), Roger Staffelbach (Artension/Angel Of Eden) and Emir Hot (solo). Essentially, with these elements, Dragon Fire is quite the cooperative effort, and the album is better for it. Frankly, I might even suggest that the vocalists overshadow Mistheria's contributions. Each vocalist was matched perfectly for the songs, John West on the whole, but particularly Lance King on Two of Us. And the fret work shimmers with equal clarity to Mistheria's keys (but I could sometimes pass on Bellas' widdling wizardry). Nevertheless, Mistheria is hardly absent. He coaxes and cajoles his typical magic from his synths and keyboards, offering styles from fusion to prog to classical. He effortlessly adds ambience across all songs and then hunkers down for deliberate and inspiring solo performance; the best come on Dragon Fire, Lies & Deception, The Power of One, and The Beast. However, I was more intrigued by his classical explorations on Prelude 18 in F Minor and Chopin Fantasy. Without doubt, Mistheria's Dragon Fire is an immense, grand, and generally gratifying work, thanks mostly to his collaboration with a brilliant supporting cast. Recommended. Without doubt, Mistheria's Dragon Fire is an immense, grand, and generally gratifying work, thanks mostly to his collaboration with a brilliant supporting cast.